I wrote a feature for the July 2013 issue of Lake Norman Magazine, "Get Your Motor Running," that focuses on car dealers and shops in the lake area that sell/build exotic, luxury, and classic cars. We're talking everything from vintage cars from the 1930s to late-model sports cars. While conducting interviews and doing research for this story, I learned that selling cars on consignment is big business, and that people search all over the world for specific cars. Because of the Internet, car dealers like the ones on Lake Norman are able to sell and ship cars to buyers from anywhere. Yes, a couple of the dealers told me they have people--from the West Coast to the Middle East--buy cars from them online without ever setting foot on the car lot or seeing the cars in person. That's why many of the dealers place detailed info, multiple photos, and sometimes even video of each of these exotic and luxury cars, to give potential buyers a good idea of the quality and appeal of the vehicle. One of the Lake Norman dealers told me he sold two of the Range Rover Autobiography Ultimate Edition SUVs to a single buyer for $250,000 each. Rolling in it! 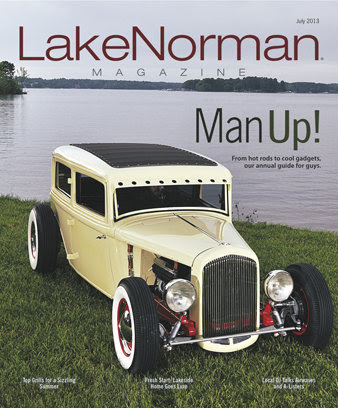 The July issue of Lake Norman Magazine is online and on newsstands now.